Made this over the weekend for a dinner party. This recipe is a modified version of my friend Kavitha's kuruma recipe. What I liked about this recipe is: Firstly, its easy to prepare it in 20 minutes or less. Secondly, very healthy and delicious without adding a whole lot of coconut which is usually dominant ingredient in this dish. Thirdly, it has an amazing flavor and taste. Lastly, a great side dish for biriyani, rice, parota or roti. 1. In a saucepan add some water, chopped veggies and salt. Cover and cook it until the veggies are half done. 2. In the meantime, heat the wok, add 1 tbsp oil. When that gets warmed up add the spices (cloves, cardamon, cinnamon, poppy seeds,fennel seeds, coriander seeds) and roast them a little for 40 seconds. 3. Add 1 onion that is cut length wise to the above spices with a little bit of salt cover and cook on medium heat and keep stirring now and then. 4. Transfer them into the blender, cool and grind till they are a smooth paste. 5. In the same wok add 1 tbsp of oil. Add ginger garlic, green chillis, onions, salt, chilli powder and turmeric powder. Mix well cover and cook until the onions are transparent. Add the tomatoes and cook for 2 minutes. 6. Add the paste to this and transfer it to the cooked veggies. Mix well. Add cilantro and curry leaves and simmer for 3 minutes. 8. Serve hot with rice, or rotis. 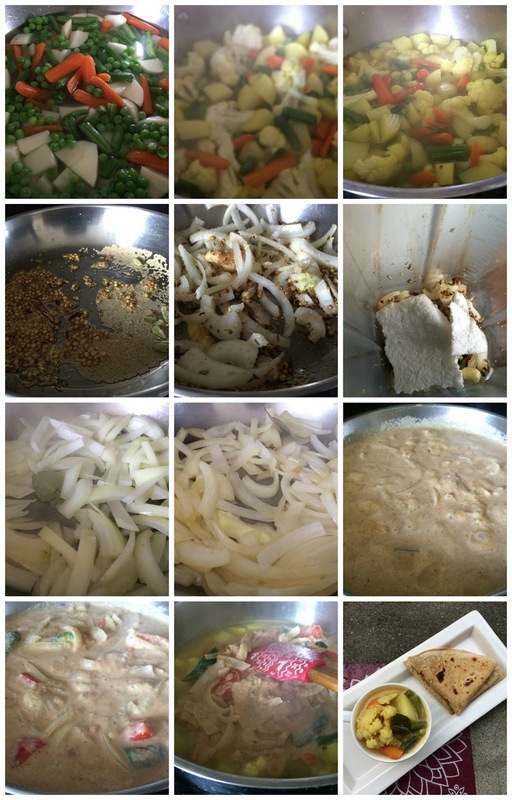 This is sowmya's friend - krishna...I made this korma to sow's house party, it was a hit. I have tried almost all ur recipes and they come out so well and become instant hits. Keep up the great work.